NEW BEDFORD, Mass. 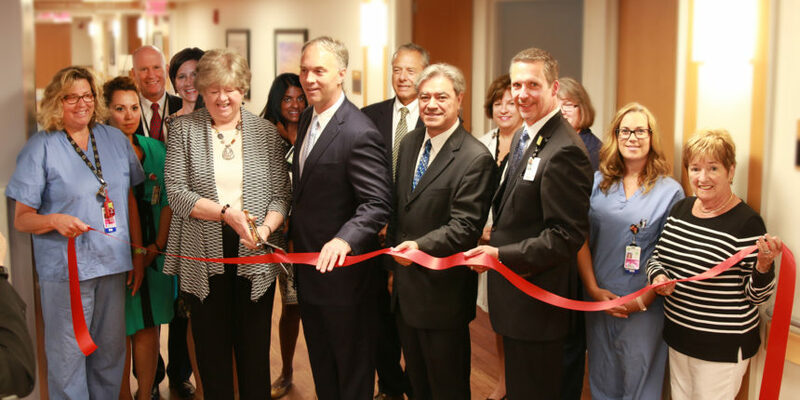 – Southcoast Health today unveiled its new, state-of-the-art labor and delivery unit, which completes the $13.5 million renovation of the Maternity Center at St. Luke’s Hospital. “This beautiful Maternity Center at St. Luke’s Hospital represents the hard work of many people – people who are committed to ensuring that our region’s newborns are welcomed by their mothers, fathers and families in the most comfortable and supportive surroundings, staffed by caring and highly skilled medical professionals, and equipped with the latest technology,” said Jean MacCormack, Chair of the Board of Trustees of Southcoast Health System and Southcoast Hospitals Group. Along with the 19 private postpartum rooms and Level II nursery that was completed in October, the new Maternity Center now includes five dedicated labor and delivery rooms (two with birthing tubs), three dedicated triage/labor rooms and two C-section rooms. The unit also houses a recovery area, three additional private post-partum rooms and additional medical/surgical beds. “We like to say that healthy communities start with healthy families, and this Maternity Center underscores our commitment to give families in the South Coast area the best possible start,” said Keith Hovan, President and CEO of Southcoast Health. This new maternity center adds to the breadth of high-quality care available at Southcoast Health. Southcoast Health recently achieved the Healthgrades 2014 Maternity Care Excellence Award – the only hospitals in Massachusetts to do so. This unique distinction places Southcoast Health within the top 10 percent of all hospitals in the nation for exceptional care provided to mothers — during and after childbirth — and to their newborn children. Visit www.southcoast.org/maternity/stlukes for a virtual tour of the maternity center and to learn more about maternity care at St. Luke’s. For additional details on the Maternity Care Excellence Award recipients, please see the complete Healthgrades Women’s Health Report 2014 at www.healthgrades.com/quality.